In this review we will discuss Terrexa – a relatively new cryptocurrency exchange company that was launched in April 2018. They boast about offering a quick and simple way for ordinary people to buy and sell cryptocurrencies. The company’s founding fathers are experienced players of the Forex industry, whose idea is quite straightforward: Cryptocurrencies trade made simple! As it was mentioned above Terrexa was started in the fourth month of 2018 and is currently owned by a holding company registered by the name of Prime Marshall Cy Ltd. It is a Cyprus-registered company and its HQ address is Arch Makariou 3, 34 Hadjiyannis Court Limassol. Terrexa’s Senior Product Manager is Amir Haimpour, who has recently stated the company’s desire to become one of the biggest players in the field of crypto trade. The brand Terrexa was first started by Leverate Trading Systems – a big tech solutions provider in the field of crypto trade, working with some of the biggest FX brokerages worldwide. These brokers use Leverate’s trading systems as a “white label product”, so Terrexa might just be the tech provider’s main rehearsal before the launch of their own cryptocurrency exchange platform. Terrexa accepts registrations from around the world. However, cryptoradar.co lists a handful of country where this trading platform is unavailable. These are as follows: Afghanistan, Brazil, Cuba, Congo – Kinshasa, Eritrea, Guinea-Bissau, Haiti, Iran, Iraq, Kenya, Lebanon, Liberia, Libya, North Korea, Rwanda, Sierra Leone, Somalia, Sudan, Syria, United States, Zimbabwe. Cryptocoinjunky.com also confirms that Terrexa is currently unavailable in the USA. The process of verification depends on the type of your account. Level One account has a trade amount limit of up to 5,000 US dollars. 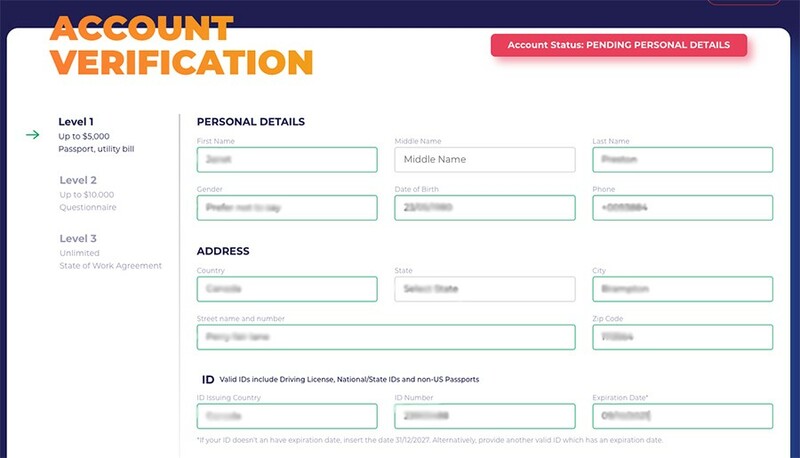 Level Two account has a trade limit of 10,000 dollars (in addition to ID and residence verification, you’ll have to fill in some questionnaire to get it going), and Level 3 account has no trade limit, but to open one you’ll need to provide a State of Work Agreement. In connection with the proof of residency, you should also provide a scanned copy of some utility bill you’ve paid over the past six months. Once you have uploaded the required copies, Terrexa will carry out some checkup and will get back to you within 24 hours. Terrexa accepts fiat currency transactions made in USD or EUR. If you wish to invest funds in a different currency, you can either convert the money prior to sending it to your account, or you can make the transaction via your credit card. Because Terrexa is still a relatively new exchange, its portfolio is currently limited to Bitcoin (BTC) and Ethereum (ETH). Their wiring fees depend on the way you are going to trade. 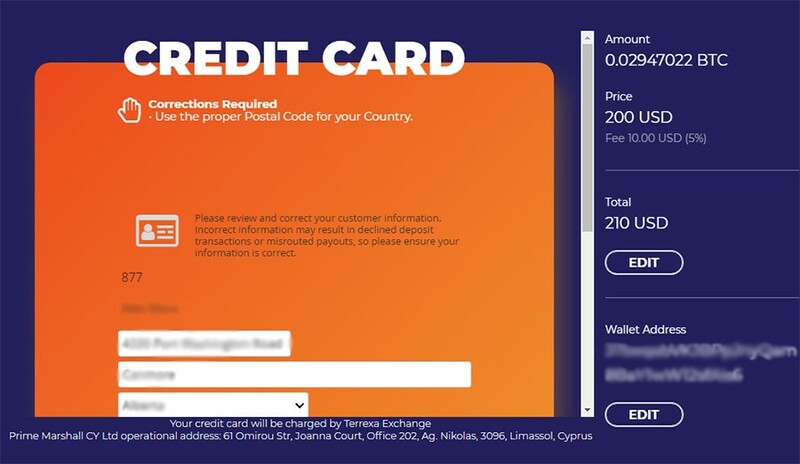 If you would like to purchase crypto coins via your credit card, Terrexa will charge you a 5% fee. Wire payments usually take between three and five business days to complete, but the fee on them is just 3%. Once you have successfully completed the account verification process, you can start trading. Because this platform was created with simplicity and user friendliness in mind, buying cryptocurrency on Terrexa is a piece of cake. All you’ve got to do is click on the “Buy/Sell” button on the header and you will reach their standard order form, as shown below. At this point you can enter either the amount of cryptocurrency that you would like to buy, or how much you wish to invest. When you have made up your mind as to how much cryptocurrency you would like to buy, you can confirm your purchase. 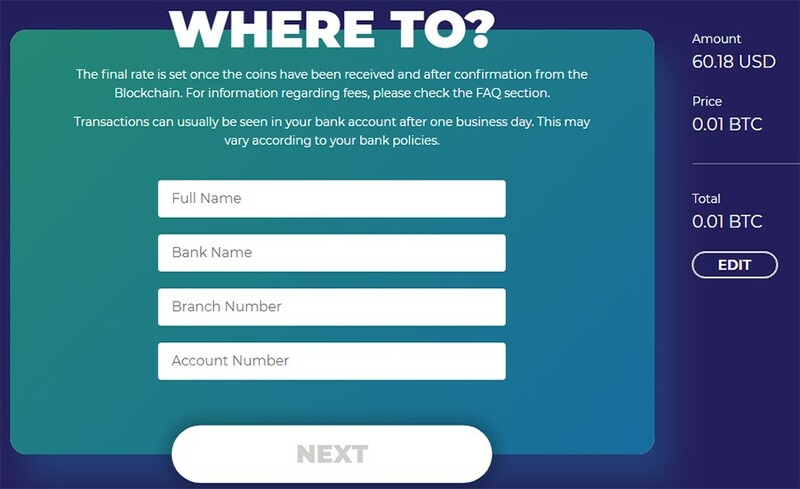 At this stage, Terrexa will ask you if you’d like to have your coins sent to the postal address you have specified in your account. Finally, you will have to confirm your payment details. If you opt to pay by credit card, as shown above, you’ll need to enter its details. If you have selected the wire transfer, you will be asked for your bank account details. “Branch Number” means the BIC/SWIFT code of the bank and the account number is your IBAN. Currently, there is no information if Terrexa supports, futures, derivatives, or margin trading. Terrexa’s policy regarding fees is very straightforward – all fees depend on how you would like to pay for the cryptocurrency that you purchase. This is one of the reasons why Terrexa is such a user-friendly crypto exchange platform. As mentioned above, if you are going to be buying coins with your credit card, you have to pay a four-percent fee, while the fee on all wire transfers is only two percent. The good news is that there are no underlying trading fees, because the rate that Terrexa will charge for your purchase includes spreads plus the abovementioned fees. Terrexa’s website is very user-friendly and easy to navigate. You have to log in so as to access its full functionality. Prior to signing up, we advise you to read some important sections in the lower part of their home page. 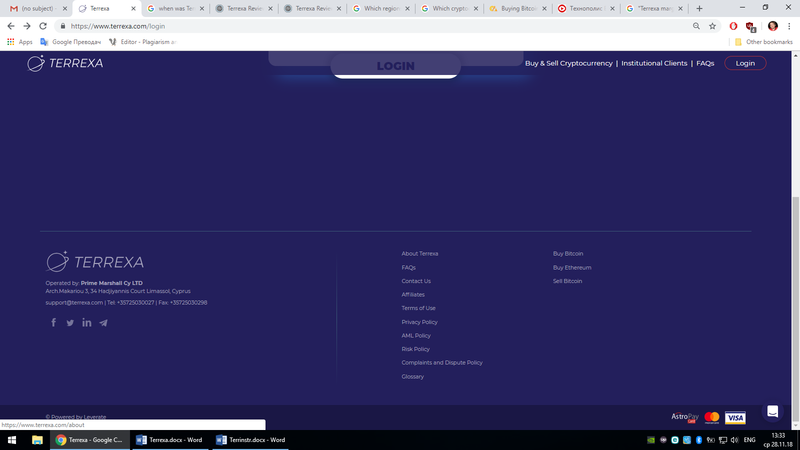 Right next to it you can see the bank card types accepted on the website and the company’s registration address and contact phone numbers are clearly visible on the left. This transparency does a great job when it comes to earning the trust of their customers. 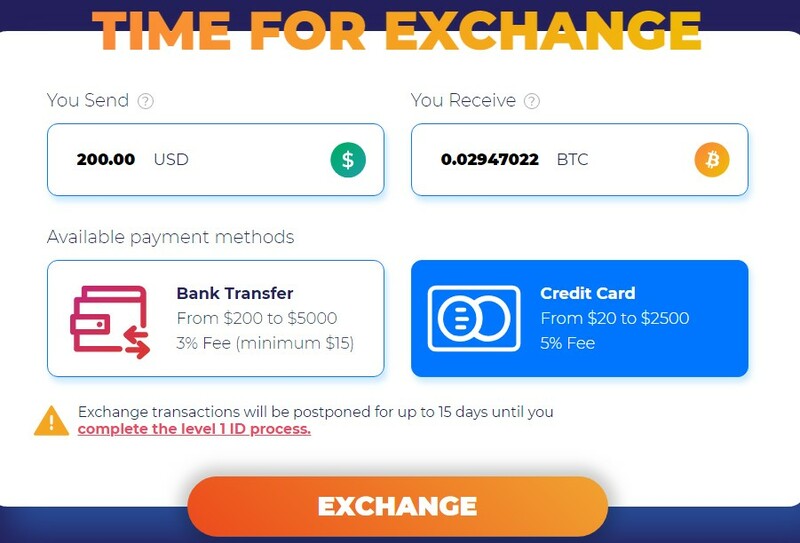 Terrexa’s current exchange rates of both BIT and ETH against the US Dollar are listed at the top of their home page and are updated in real time. As mentioned above, you can get in touch with Terrexa directly from their homepage. Once the dialogue box opens, you can type in your message and even send them a file as an attachment. You can also give vent to your emotions with a wide range of emoticons, too. Customer support is also available over the phone. Should you encounter any issues, do not hesitate to call +35725030027. This is a local number, so the price per minute will depend on your mobile phone subscription plan. Calling them via Skype or VoipCheap might be a better idea. If you don’t want to wait in a long queue of customers at the phone, you can always send them an email at support@terrexa.com. The most common questions that Terrexa’s customers ask have been answered in the FAQ section of their official website. However, he, too, observes that “This broker has some improvements to make before I can take them seriously”. A third trader by the name of RParker adds that “Terrexa is simple and very straightforward. Their customer service is also quite responsive”. However, he concludes: “Terrexa has some limitations in their trading experience that I didn’t particularly like”. One of the fundamental questions for any trader when it comes to registering on a cryptocurrency exchange platform is: “Is my money safe on their website?”. For our readers’ comfort and peace of mind, we are happy to announce that ever since it was launched, Terrexa has never been hacked. One of the best things about Terrexa is that they operate solely as crypto exchange gateway. This means that they do not keep your money on their website. Thus, you can rest assured that your money is safe in your electronic portfolio, or in your bank account. The fact that they do not stash cash or coins on their servers makes Terrexa a very unattractive target for hackers. Terrexa has full SSL encryption on their domain, so entering your credit card details and personal info on their website should be perfectly safe. All of these sensitive exchanges are encrypted through the 256 Bit standard. 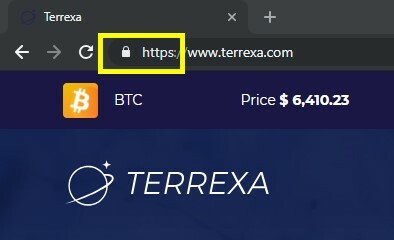 Whenever you log into Terrexa.com you see a padlock next to their domain. This means that you are on the right Terrexa server and can safely send them the required information. 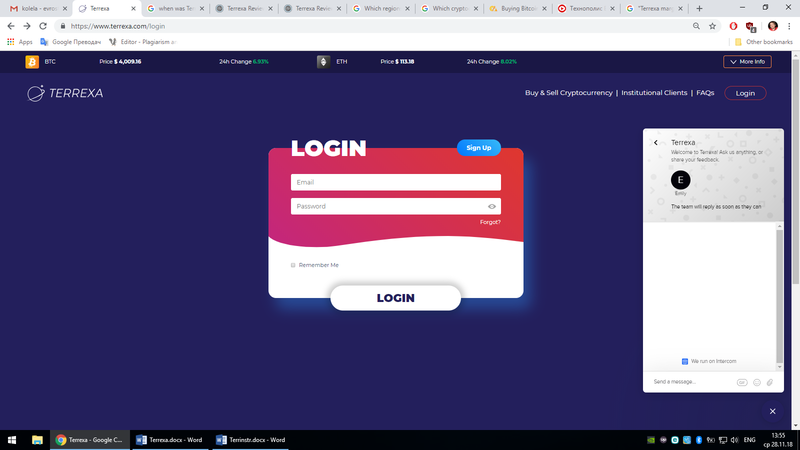 Unfortunately, Terrexa does not offer anything in the way of two factor authentication and for that reason it is still lagging behind many other cryptocurrency exchanges and wallets. On the same note, we could not find any info about SMS / email alerts, or PGP encrypted emails supported or provided by Terrexa. As we made it clear this cryptocurrency exchange platform does not store coins on their website. So, if you still do not have your own cryptocurrency wallet to safekeep your coins, then you can take advantage of Terrexa’s mobile wallet. This is available on both Android and Apple devices. While Terrexa is still a new player in the field of cryptocurrency exchange platforms, they seem to know what their strong points are. They have made it simple for users from around the globe to experience the thrill of cryptocurrency trading. Although it is true that the platform is still in the process of earning its reputation, we fancy the fact that they have an established and trusted Forex technology provider behind them. On the whole, Terrexa is safe to use, because you do not store your money on their website, neither do you keep your coins with them. This being said, Terrexa still has a long way to go before they can challenge some of the cryptocurrency trading giants, especially with regard to diversification of their coin and fiat portfolios. In terms of security and two-way authentication, Terrexa can still make some progress. In addition, the platform currently only allows traders to convert their Bitcoin into Fiat currency. This means that if you possess ETH, you should first convert it to BIT and then to one of the two fiat currencies that Terrexa supports. With that in mind, Terrexa is still a new thing and as such it has got huge potential for growth and further development. For now, this low-risk platform is the perfect choice for those who are making their first steps in the field of cryptocurrency trade.